Marvelous, very delicious and awesome dish made from improvised ingredients. Tender and fresh loin cut, under very thick and rich sauce made from homemade wine, vinegar and molasses. It was served on the avocado meat garnish. This is the true explosion of flavors! We also didn’t forget about your another senses! Beautiful winter scenery, fire, sounds of nature and crackling snow will gently envelop and relax you, take a cup of something warm and come join us by the fire! 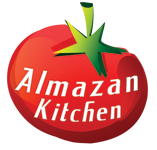 You’re very welcome to the AlmazanKitchen land of Foodporn and ASMR! Slice the halves, then remove the skin. Chop well, sprinkle with lemon juice. Crush the avocado meat till mushy consistency. Spread the crushed avocado meat all over the wooden plate simultaneously. Unpeel the onion then cut it into major slices. Slice 700g of good loin cut. Slat & pepper the meat slices. Preheat the pan. You already greased it with oil, did you? Toss meat into the pan, cook until slightly brown texture. Do not forget to stir and flip. Toss the onions into the pan. Cook till ready, do not forget to toss & stir. Transfer the meat with onions to the wooden plate with avocado. Do not remove the pan from fire, and surely do not clean the pan after the meat cooking! We will use the leftovers for the sauce. Deglaze everything left in the pan with 1 cup of homemade wine. Also pour 1 tbsp. of vinegar into it. Molasses time, 1.5 tbsp. is just enough. Cook until rich saucy consistency. Pour the sauce all over the dish.